The success of the application of the mating disruption method as protection depends, in addition to other factors, on the grower’s knowledge of the biology and behaviour of the pest and, in general, on the implementation of the method in question. In mating disruption, pheromone is released from dispensers that act as false sources, or pheromone is released at such a high rate that the male is disorientated or unable to detect the plume of the calling female. Male moths find potential mates by following the trail of a scent (pheromone) emitted by the female of the same species. This substance attracts males, causing them to initiate a particular sequence of behaviour that begins with their guided flight and ends with mating. 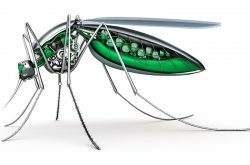 Mating disruption consists of disturbing mating by saturating the atmosphere with synthetic pheromones released by dispensers. In an atmosphere saturated with this pheromone, the males cannot locate the females, which emit pheromones at a lower concentration than the dispenser. The aim is to prevent mating so that no eggs or larvae are formed, thus, no damage is incurred in the area covered by the pheromone. The synthetic pheromone used in the orchard is distributed by dispensers. Several types of dispenser are currently available in the market. 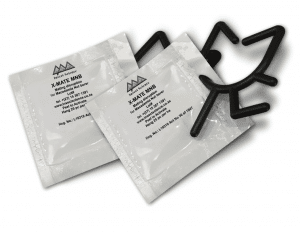 The dispensers most frequently used are ISOMATE, commonly known as “spaghetti”. The use of this method of mating disruption has been approved in South Africa. It is advisable for the installation of dispensers in the orchard to be supervised by a technician responsible for coordinating the personnel who will carry out the work. A brief advance meeting with the personnel should be held to explain the importance of the correct manner of application of dispensers along the row and the management of the borders. See below for insulation instructions. 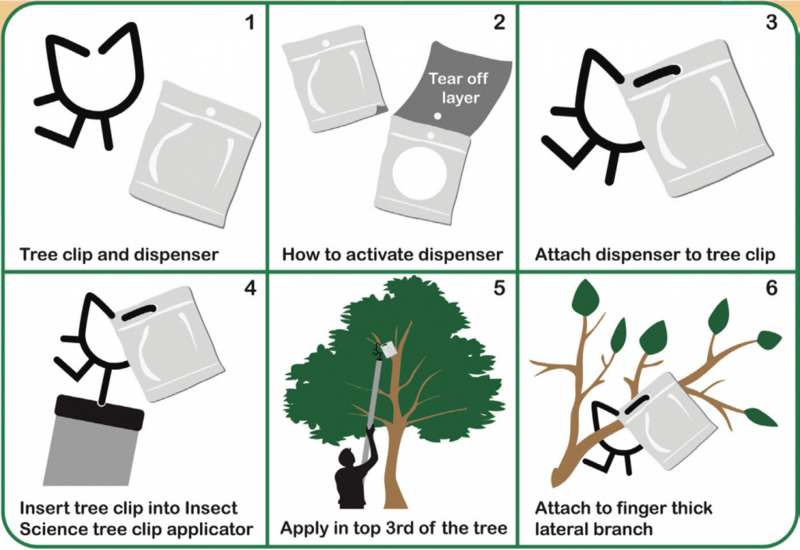 • The dispensers should be applied in the top third of the canopy of the orchard by using the Insect Science (Pty) Ltd X-Mate™ applicator. • If there is no tree where a dispenser was supposed to be placed, the dispenser should be placed on the tree situated just before or after the space. The dispensers should only be applied to a diagonal tree if there is a large space of more than 15m without a tree. • The placement of the dispensers must begin on the orchards with the greatest susceptibility and history of attacks and to ensure the number of dispensers used on those orchards are as previously calculated. • In the border zone, where strong prevailing winds or steep slopes are present be sure to start the application outside of the treatment block, the distance between dispensers must be in accordance with plant spacing. The first evaluation of the method’s effectiveness involves the observation of the pheromone base traps located in the orchard treated with mating disruption and the comparison of the number of captures with those obtained in traps located outside the area treated with mating disruption. 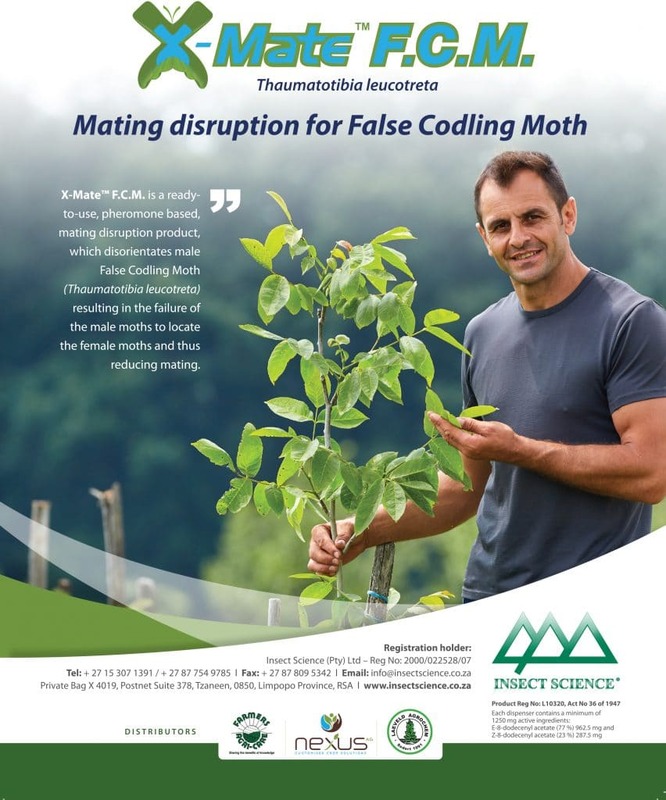 If the method works well, the male moths will not be able to locate the pheromone trap, and there will be no captures in the orchard where mating disruption is applied. This result means that the males will also be unable to find the females, and therefore no mating or damage will occur. The absence of captures in a trap is not a guarantee that a particular orchard has not been infested. If the pheromone is not uniformly distributed in the orchard and certain conditions are present the risk of mating will increase. Thus, in addition to monitoring the pheromone traps, sampling should be conducted to assess the damage in each generation. The samples should be collected both in orchards treated with mating disruption and in control orchards. Does not affect Beneficial’s, safeguarding the presence of predators and parasitoids that limit the presence of macadamia pests. Its use enables a balance between the pest and his antagonists to be achieved in time. Non-toxic to the labour applying the product. Does not leave marks or residues on the fruit. Has a cumulative effect if used repeatedly over the course of several years. The pest does not develop immunity or resistance to the product. It is easy and rapid to apply, and application is required only once a year, at the start of the programme, and at a time when there is little work in the orchard to be done. Can be used as a commercial argument to promote agricultural production through the use of an “environmentally friendly” means of protection against pests. The minimum area required is 10 ha. Orchards with less ideal conditions (very windy, steep slope, or varied orchards) make it difficult to maintain the pheromone cloud on the site. On sites with high levels of attack, the 1st year of application generally requires application of an insecticide to reduce the initial population. Under certain conditions (e.g., significant pest density, small orchards, strong winds, or late placement of dispensers), mating disruption may not guarantee the required effectiveness. Due to its specific characteristics, mating disruption does not ensure protection against other pests.